Huddersfield and Brighton meet in the Premier League this weekend in what is a vital game for both sides. Brighton & Hove Albion will be looking to get back to winning ways this weekend when they travel to Huddersfield Town in the Premier League. The Seagulls have only picked up one point from their last three games, after Jamie Vardy rescued a point for ten-man Leicester City last weekend at the AMEX Stadium. However, Huddersfield head into the clash in great form having won their last two matches against Fulham and Wolverhampton Wanderers and in doing so have moved out of the relegation zone and find themselves just two places and five points behind Brighton. 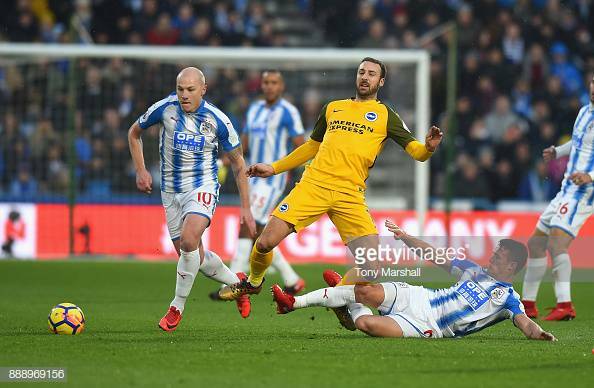 The Terriers got the better of Brighton last season at the John Smith's Stadium, beating Albion 2-0, before then drawing with the Seagulls at the AMEX. Brighton will be hoping to have club-record signing Alireza Jahanbakhsh fit and available for selection, after he has missed the last two games with a hamstring injury he picked up against Everton. All of Martin Montoya, Gaetan Bong and Solly March will be looking to make a return to the starting eleven after they were dropped to the bench for the Leicester game with Bruno, Bernardo and Pascal Gross starting in their place. Both Glenn Murray and Matthew Ryan are expected to start despite picking up knocks in the draw against Leicester. The only certain absentee for the visitors will be Dale Stephens, who will serve the second of his three match ban. Huddersfield will have Mathias Jorgensen available after missing the win over Wolves due to suspension, after he picked up his fifth booking of the season in the win over Fulham. Steve Mounie, who scored a brace against Brighton last season in the 2-0 win at the John Smith's Stadium, is set to lead the line on Saturday. One man that Huddersfield will need to keep an eye on this Saturday is 35-year-old striker Murray. Albion’s top scorer grabbed his seventh goal of the season in the 1-1 draw against Leicester. The even more impressive thing is that Murray has scored his seven goals from nine shots on target, which means that Huddersfield will try not to allow him to have many efforts on target as otherwise they might end up with Murray putting the ball in the back of the net. Murray was impressive last season for the Seagulls scoring 14 goals in all competitions. Considering that he is in the latter stages of his career, Murray has impressed even more this season scoring seven goals in just 13 games. His form has seen him go past the 100 mark for Albion in terms of goals scored, having 101 to his name and is only 23 goals from becoming the Seagulls all-time record goal scorer. To have scored 101 goals in 231 appearances for Brighton over two spells is very impressive and is something Murray will add to if he continues to play like he has been this season.